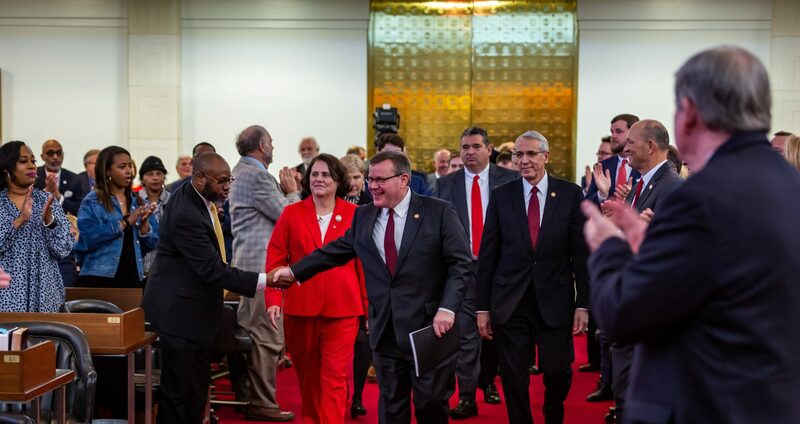 RALEIGH – North Carolina House Speaker Tim Moore officially began his second term on Opening Day of the General Assembly, Wednesday, January 11, 2017 at 12:30 pm and delivered prepared remarks to members and guests. Thank you, Madam Clerk, Members of the Supreme Court, special guests, and fellow representatives; it’s a privilege to be with you today. I am so proud to be on the House floor with my family, to be with them here today and have the privilege to accept your nomination to serve again as Speaker of the North Carolina House of Representatives for the 2017-2018 biennium. Congratulations to our new members who are serving here as representatives for the first time. Best wishes to you as you begin your service – and good luck finding your way around this building – it can be a little confusing. Congratulations to the members upon whom the honor of re-election has been bestowed. Congratulations to the family members of all of the representatives – thank you for the sacrifice that you make to allow us the opportunity to serve our state. This first day of Session is always a special one – there is a feeling of exhilaration for the opportunity that we all have to serve our fellow citizens. In like manner, I feel exhilarated to represent you as Speaker of this House of Representatives. My words cannot express the gratitude and appreciation I feel to have your support today – I am honored to serve as your Speaker. North Carolina is such a special state, not only to us, in our own hearts and minds as natives and residents, but in the history books of our great nation. What’s special about North Carolina? I believe — just about everything. Our landscape is breathtaking — from the beaches of our coast to the Great Smoky Mountains. North Carolina is a top-ten state for tourism, year-after-year, because of the abundance of our natural resources, our rich history and our cultural resources. People come from around the world to drive on our mountain parkways and visit our Outer Banks where the Wright Brothers first took flight. Our state is full of a multitude of historic treasures like my hometown, Kings Mountain, a turning point for determined patriots seeking independence in the American Revolution. So much of our state’s culture and identity is rooted in agriculture. We have the finest farms not just in the Southeast, but in the entire world. Our culture in this 21st Century is also defined by a world-class art museum and other outstanding museums and attractions that are often referred to as the Smithsonian of the South. We are honored to live in the greatest state in our great nation. Now, as we gather here today, I know you join me in being so very proud of North Carolina. I’m proud our state is on solid financial footing thanks, in large measure, to the hard work of this House. We are one of the fastest growing states in the country, and poised to continue creating jobs in so many key sectors of commerce like finance, information technology and medical research – among many others. While sustaining our small businesses with tax relief and regulatory reform, North Carolina is also cultivating core industries that can sustain investment in our rapidly changing economy. 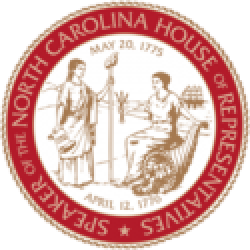 As Rep. Setzer said, thousands of new jobs are being created in North Carolina every month with broad growth among small businesses and large corporations, alike. We have world class universities in every direction from here in Raleigh, some of the smartest inventors and researchers come here to learn, to teach, to research, and to develop because we offer higher education of the highest quality. North Carolina continues to serve as an epicenter for commercial activity – global technology companies have created a world-class hub for innovations right here in North Carolina – and their innovations are changing lives around the world. All this means we have an immense responsibility to our fellow North Carolinians — we are called to serve them – and there is no greater honor than serving – as Jesus said, the greatest among you will be the servant. So let us each have a servant’s heart throughout this biennium. We will not always agree, but let us disagree respectfully and with kindness. It seems to me that North Carolina has always existed with a little rivalry and yes, even some division – but, in the end, there is always much more that unites us. There are rivalries of east and west, different basketball teams or competing NASCAR drivers, political parties, and even different types of barbecue – but in the end, we are all North Carolinians. In the end, we have goals for our state that much more alike than they are different. We want job creation and growth – there are so many things that make our state attractive to new businesses and relocating businesses – we need to continue to make necessary reforms to produce more jobs. Citizens in the private sector are driving investments that have put more people to work and grown our tax base. To keep growing we must maintain our commitments to tax reform and relief, pass balanced budgets and cultivate a workforce that is career-ready in an increasingly innovative world. It is critical that North Carolina continue to develop a diverse economy to attract investment and remain competitive. It is my priority to work with each of you to make North Carolina the most competitive and prosperous state economy in the nation. Further, our state needs a dynamic education system that serves students with the tools they need to lead North Carolina into the next decade. We must work together to help our students achieve and our school systems, Community Colleges, and Universities succeed at every level in a new era for education in North Carolina. And thanks to our commitment to hardworking educators, first-year teachers in North Carolina will, at long last, make at least $35,000 a year. Finally, we have a duty to conduct our government in the responsible and prudent manner with which families and businesses manage their finances, plan for unforeseen events and prepare for times of need. Members, we will soon face important decisions that affect the financial security of the public — decisions that will influence the future of our state. Issues requiring us to weigh choices that impact the economic vitality of our great state and the protection of our citizens will come before us. I pledge to you, members and the citizens of North Carolina, we will make those decisions together in good faith with the priorities of our people put first. I promise to be a Speaker who empowers you to represent your district as only you can, whether your constituents live in one of our major cities, one or our historic small towns, or in the rural splendor of our state. I promise to work with you to give North Carolinians from Murphy to Manteo, from Cherokee to Swan Quarter the representation they deserve here in Raleigh. Thank you, again, members and distinguished guests, for a meaningful and very special opening day of the 2017 legislative session of the North Carolina House of Representatives. God Bless You and may God continue to bless our beloved state of North Carolina.